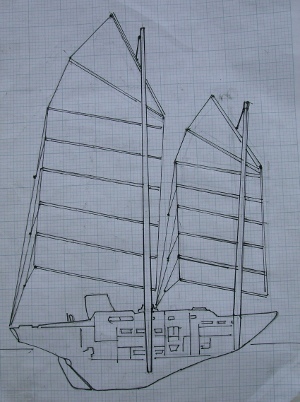 To the left is a basic sketch of the junk schooner plan I’m working towards. Foremast: 31 ft LOA, 27 ft LAP, 5% forward rake. The CE (centre off effort) has about around a 7% lead over the centre CLR centre of lateral resistance) a few points aft of the conventional CE. This entry was posted in alberg 37, junk rig, junk rig design, masts. Bookmark the permalink.